There are many ways to screw up your noodles. My first dozen attempts were unsuccessful for the simple reason that I refused to believe that the recipe really meant that should I knead the dough for ten minutes. I didn’t respect the process. Turns out that I’m bound by the rules of food science and my needs come second to the process’s. These days I knead for approximately two Yo La Tengo songs or one Brahms adagio. But I’m getting ahead of myself. This is a process, not a recipe. The map is not the territory, read through to the end. Stage One. Make a pile of flour in a large mixing bowl, dig a well in the center. Crack open eggs, pour them in and beat them. You’ve probably seen pictures of people doing this directly on flat surfaces and while that may feel romantic there’s not really anything to be gained from it other than the opportunity to make a mess. I’ve tried it often enough to be certain. Pull in flour from the edges with a wooden spoon, mix it into the eggs. Keep on doing this until you can’t easily do it anymore. Dump the mixture onto a very well floured wooden board (or another—inferior—work surface). Knead it for at least ten minutes, taking care to add flour every time it gets sticky to touch. Stop kneading when it a.) stops becoming sticky, b.) is smooth, and c.) it springs back slowly when you poke it. Cover it with a bowl and let it rest while preparing to continue the process. Proportion is the key to fresh egg noodles, which are just eggs and flour at their simplest. 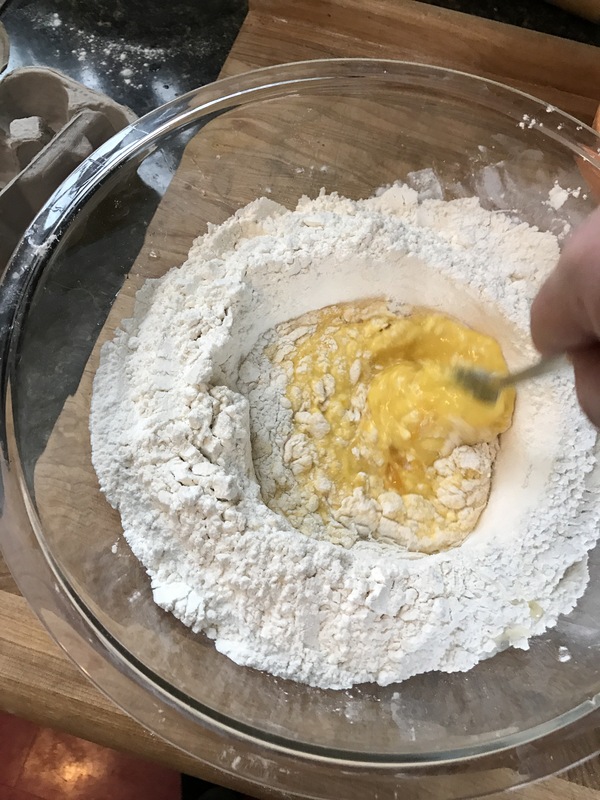 If you look online you’ll find recipes, but really the process dictates the proportion if you know what the goal is… to saturate the eggs with flour and knead till the dough is smooth, firm, resilient, and not at all sticky. I couldn’t give you precise numbers if I wanted to, nobody could. Anybody who offers you precise numbers doesn’t respect the process. 210g of flour to two eggs is a practical starting point, you can always add flour and you can’t start with too much. Kneading is an act of transformation, a gestational period. Stop to consider all of the things that are eggs and flour. Keep a shaker of flour nearby, that’s your WD40. Keep water away, that’s your glue. Stage Two. I have an Imperia commercial pasta machine, which I bought and used during my Italian deli-owner phase. But small serviceable machines are available everywhere, these are substantially the same, just less efficient. The process demands that you repeat it, and it’s hard for me to conceive of anyone doing that if it’s nearly impossible to get consistent results. So while it’s true that you don’t absolutely need a pasta machine, get one anyway. Flour is going to get everywhere, because it needs to be everywhere. Even if the dough ball is a little rough, the process will ensure the result—if you understand the process, it won’t let you down. Secretly the beginning of Stage Two is the end of Stage One. Pull the dough ball out, dust it with flour and then roll it at the machine’s widest setting. Take the flattened dough ball, dust it with flour and then roll it at the machine’s widest setting. Take the flattened dough ball, fold it in half, dust it with flour and then roll it at the machine’s widest setting. Do this until it becomes smooth, and then move on to the next setting. If the pasta tears and separates, dust it with flour, fold it and roll it again until it’s smooth. Continue to do this, dusting it liberally with flour on both sides until it’s the desired thickness, which is… undefined (actually on my machine it’s a tad more narrow than #2 on the dial). You will end up with long sheets of pasta, set them aside (but don’t let them dry out). I hang them from a wooden dowel and post two small children to keep watch for the cat. Stage Three. Using the pasta machine’s cutter, I made some tagliatelle for lunch with half. The rest became New Year’s lasagna—which involved two additional processes: making marinara and besciamella sauces. But I only need one metaphor to make my point. When we confuse the recipe for the process without taking time to understand or respect it, we fail. We understand the process by making mistakes and correcting them. And that’s what I’m thinking about on the first day of 2017.